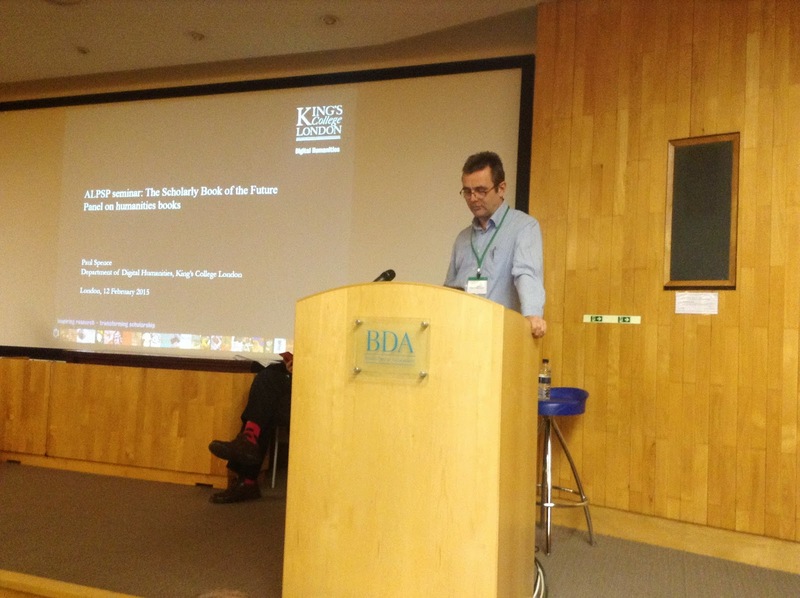 ALPSP blog: at the heart of scholarly publishing: What next for humanities books? Many publishers now spend less time understanding the underlying cultures of the specific research communities they serve. The humanities has been accompanied by rhetoric of perpetual crisis, with contemporary concerns over utility, research income generation, the allocation of resources and the quest for impact, all in a digital context. Anthony Cond, Managing Director of Liverpool University Press, asked how publishers can speak to these concerns, support authors, build readership and understand how innovations are received by the community. When it comes to understanding the present, we need to take into account the historical performance of humanities students. As a discipline it peaked in the 60s. What we're seeing now is a fairly consistent level. Today, in the UK just over 10,000 full time equivalent researchers were submitted to the REF 2014 with quality coming third. In 2014 the JISC survey found 95% of humanities respondents viewed writing a monograph as important or very important for career purposes. Half felt it was difficult or very difficult for someone at their career stage and in their discipline to do so. Only 10% found it difficult or very difficult to access a monograph. There was also an even preference for print and digital books. Is there an issue around understanding (or not) of DDA or STL? The primary purpose of DDA is to align library purchasing with scholarly activity. Not about saving money. Social scientists are more likely to buy a book, humanities scholars more likely to borrow from the library. When understanding impact, publication is dissemination, impact is about getting outside of the academy. In the UK, research publications have to have a wider application. They need to be written to be read. This shows the editorial craft value that publishers can add. They need to capture its use, citation and influence. Consider having an impact section on your book proposals. The humanities remain viable and the monograph is still important. Scholars will want books with greater potential for impact, greater editorial input, available in print and digital. Cond closes by quoting Rick Anderson: it's not about innovation, it's about relevance. 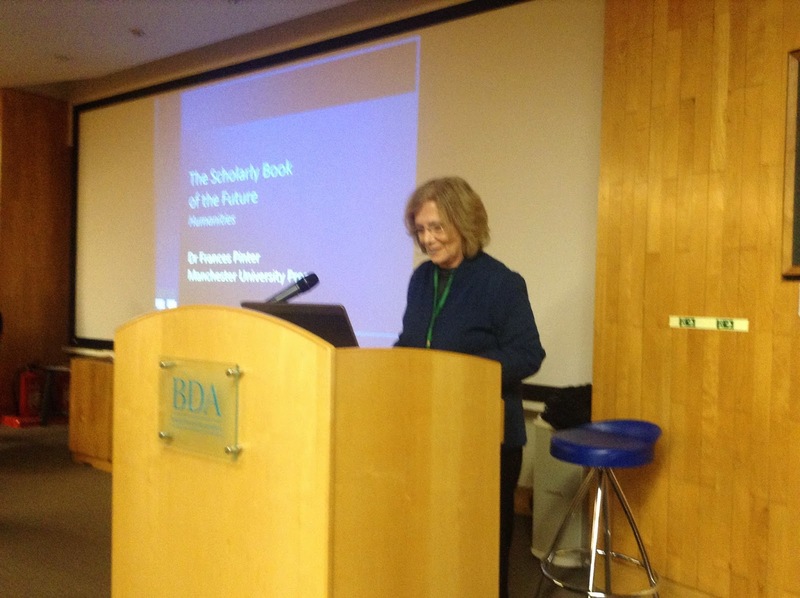 Frances Pinter is CEO of Manchester University Press and Founder of Knowledge Unlatched, a new approach to funding scholarly research. She reflected on the challenges and opportunities afforded by the impetus towards digital research tools, digital output, multiple formats and open access in a humanities context. Characterising the humanities is difficult because the boundaries are least well defined. Everything about digital means that these boundaries are being redrawn. As publishers, we need to better understand what is happening to the knowledge infrastructure in and between disciplines. What's changing? 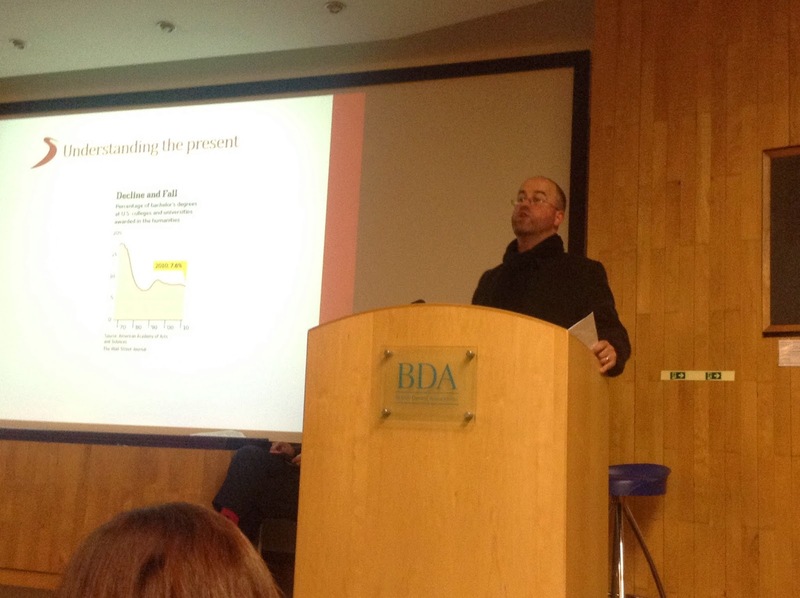 Selecting and analysing data is transforming how humanities can describe what they do. Control of dissemination is evolving and changing. With scholars and scholarship, using digital techniques is not new, but it's becoming more visible. In the US, there is more recruitment in digital scholarship, peer review is changing and there is a new role called 'Alt Ac' - not tenured and happy with that. Part teaching, part practical, part interdisciplinary. Crucially, interdisciplinary is not on the table, it IS the table. How do scholars go about managing that? There is a real opportunity with the long tail of humanities publishing - the ongoing longer life of sales. Publishers can lead in helping with new forms of peer review. They can be clear about the value of brands. They can help authors in this transition to be better communicators. Not everyone can be a Brian Cox, but publishers can help with initiatives such as Thema (a new coding structure to deal with interdisciplinarity), Kudos, etc. Paul Spence is a senior lecturer in the Department of Digital Humanities at King's College London. He observed that it is often stated that the humanities have been slower than other academic sectors to react to the information age. Yet they have the most to gain from digital innovation. With a background in collaborative scholarly resource projects in the humanities, often with a strong emphasis on modelling and XML and semantic web type technologies. He doesn't have a particular vision as the longer he's worked in this area, the more questions he realises there is. Web technologies are increasingly open so that humans and machines can analyse. In the humanities, when compared to huge transformations in society, this isn't the same in these disciplines. The biggest criticism of digital humanities at the moment is that it mimics non-digital version. They also tend to be very textual without connecting to geospatial evidence for example. There's also not much evidence of the performance related (e.g. for drama). There is potential to develop new visualisation using textual and historical data. There was much made of the social potential breaking down walls between creator, writer, audience. That's not really come to fruition. In the digital humanities, a lot of time is spent trying to enrich what is essentially inert information, meaning that it's not that dynamic or engaging for the user. We should also consider if there is more potential for aggregation and disaggregation? Integrating Digital Papryology is a Mellon funded project that attempts to document group collaborative peer review. Another interesting aspect is the idea of the enhanced publication model. Rich internet publication is not limited to report the results, but also allows interrogation of underlying data sets and models. Not common at the moment, but may become more prevalent in the future. They have a number of ongoing partnerships - including with publishers - that are very important in rethinking the future of the scholarly book.